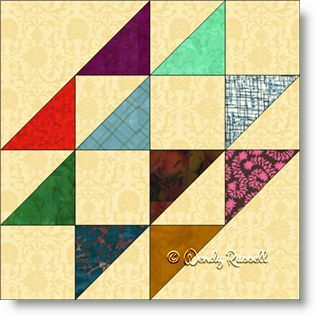 The Hovering Hawks quilt block is a fun block to select in order to use up your scraps. Of course, you can also choose to colour coordinate the pieces, but this is a great opportunity to explore making a "scrappy" quilt with lots of variety in the pieces. The block is made of half square triangles and squares. By using four individual blocks and rotating each block of the four at a different angle, a new and different quilt block is produced. Both of the sample quilts shown, use this method of four blocks sewn together as a single quilt block, producing very different results.